here are many learning opportunities in every project, for both novice and more seasoned crafters. This project has certainly provided many of those. I learned a new faux painting technique. I realized that next time I will try to only work on pieces not currently in use in the house. I learned that it is important to pay attention when working on more or less complex projects lest some amount of redoing will be in order. Then again, isn’t this a blog about redoing and recycling? And, more fundamentally, I continue to learn to accept imperfection and to bravely blaze the trails of the various crafts I attempt. 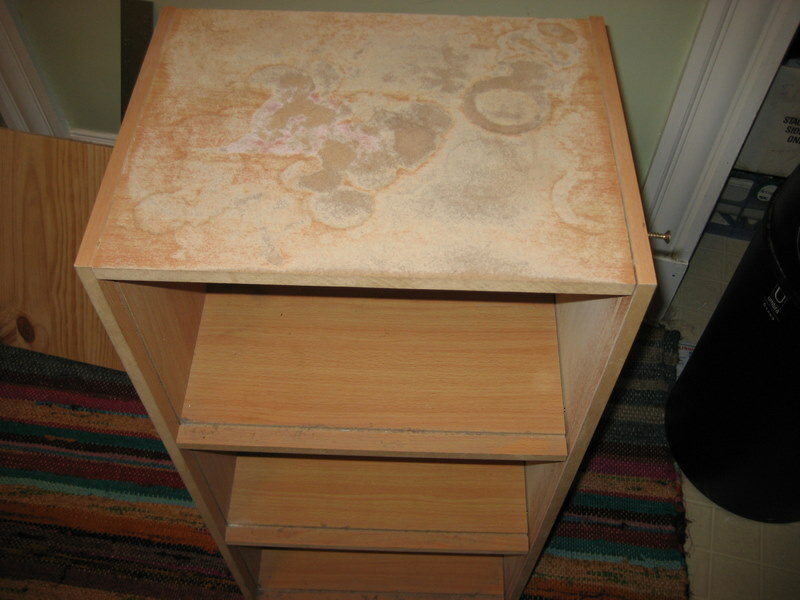 This was a pressboard shelf from our grad student days. Mike used it to store his sheet music. 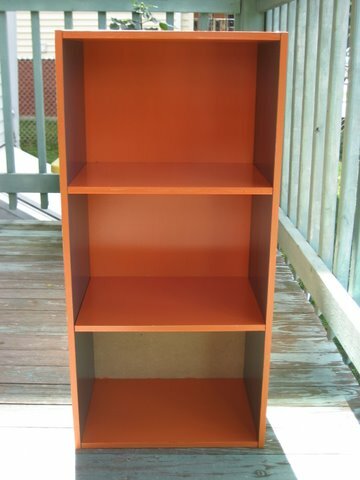 It has seen better days, so I thought I’d repaint it and continue using it as a bookshelf. However, when we moved to our apartment in Boston, our bathroom didn’t have enough storage, and the shelf was a perfect fit for the space. At a danger of claiming someone else’s idea as mine, Martha Stewart describes the herringbone painting technique in detail here. When I saw the herringbone design and the apparent ease of its execution, I thought that it will be a fun project to work on and the resulting “after” would spice up the somewhat subdued colors of our bathroom. 1. Porter-Cable random orbital sander – this was a welcome purchase given that I used to sand all my other refinishing projects by hand. 2. Acrylic paint. I used three colors of Ace-brand paint: Carnivale (F20), Flannel Suit (D44-6), and Seal Point (D36-4). A note on shopping for paint: since I was experimenting with unusually (for me) bright colors, I did not want to have leftover paint that I would have to store in my space-deprived apartment until I could find another use for them. Therefore, I bought sample jars for around $3 each and found that two of each color was sufficient for the project. 6. 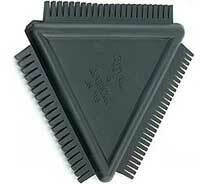 Triangular rubber graining comb, similar to this one. 8. Screwdriver to disassemble and assemble the shelf. 1. 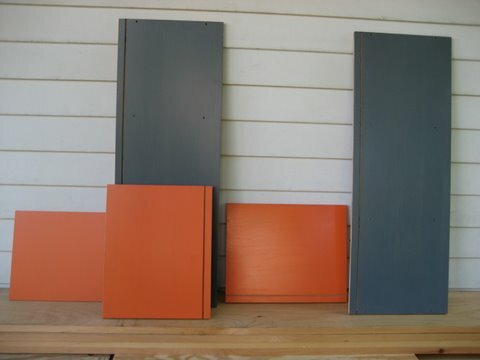 After disassembling the shelf, I sanded each surface of the resulting panels. A random orbital sander is such a fun thing because the sanding disk rotates in random patterns while also vacuuming up all sorts of paint and sawdust. 3. 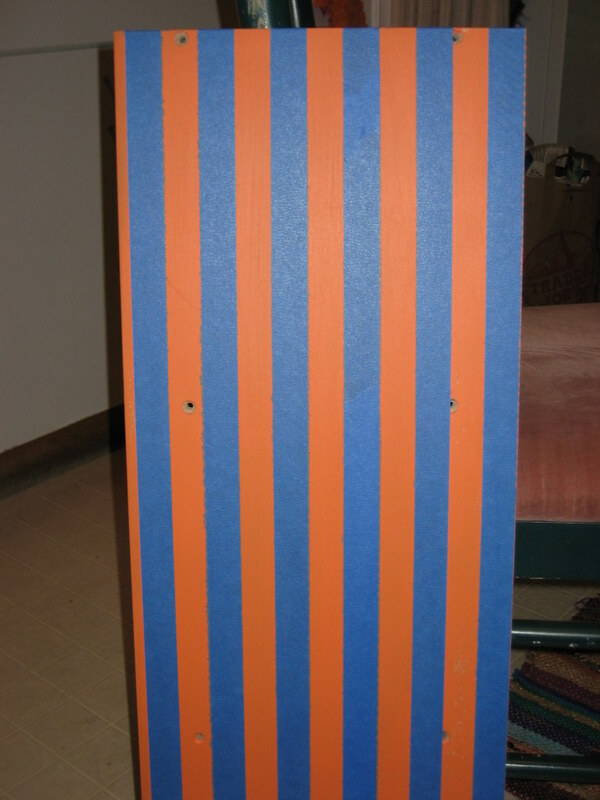 For external surfaces – the sides and the top of my shelf – I started with two coats of orange paint and no polyurethane for now. 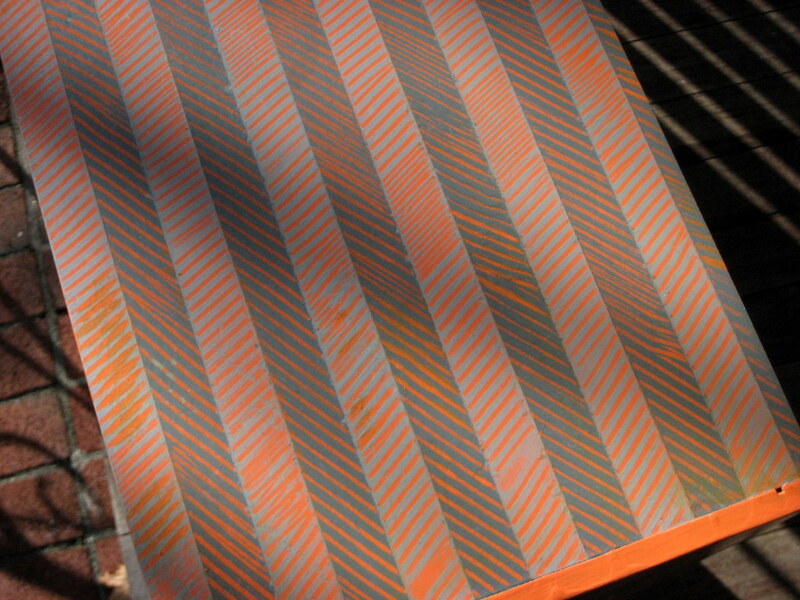 These are the surfaces that would have a herringbone design on them. 4. Using painter’s tape, I covered the sections of the surface that I didn’t want painted, leaving one-inch gaps that would be painted in the next steps. 5. Starting with one of the panels, I painted the entire surface with the mix of glaze and grey paint. Finding the right proportions of paint and glaze took some time. Various websites suggest different quantities of paint, glaze, and water. Through trial and error, I found that one part paint to one part glaze was the perfect combination that was neither too runny nor too quick to dry. 7. 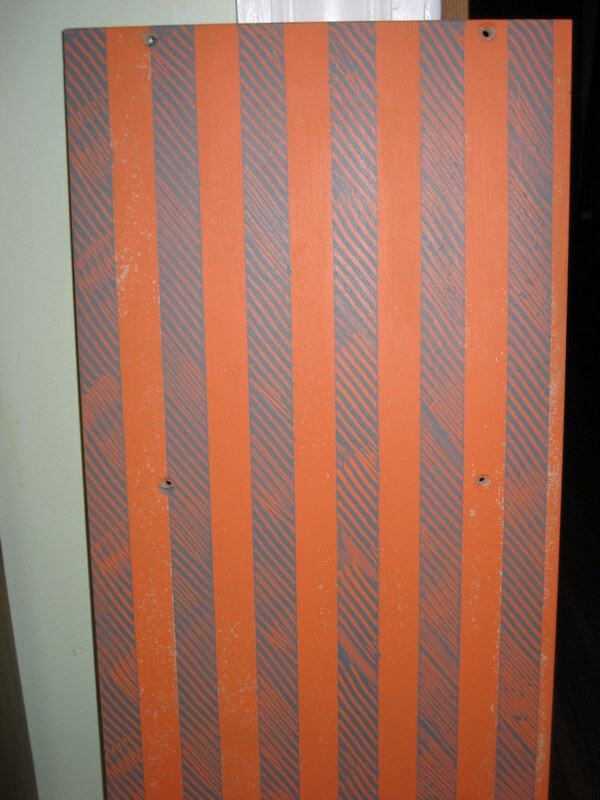 After the paint is dry, apply painter’s tape on the areas that have already been painted with herringbone design to reveal the stripes painted in base color. But before you do this, please, please, PLEASE, mark the direction of the diagonals on the design that you are about to cover. I didn’t do this at first and ended up dragging the comb in the same direction as the covered sections. 9. 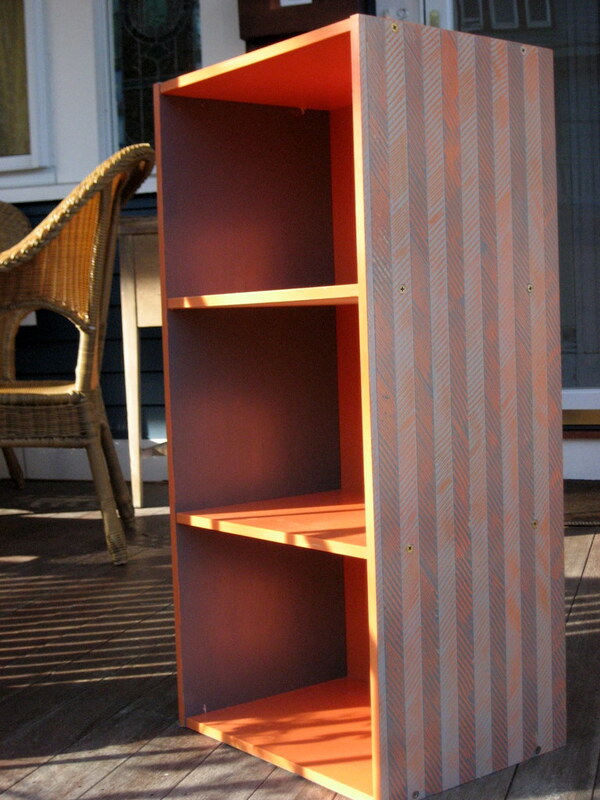 Finally, once the paint dried, I applied two coats of polyurethane over the herringbone pattern and reassembled the shelf. Before using, let the polyurethane dry for 24-48 hours. This allows it to “cure” and prevents the surfaces from being sticky.